A 21-year study of a pair of ancient stars — one a pulsar and the other a white dwarf — helps astronomers understand how gravity works across the cosmos. The study was conducted with the NSF’s Green Bank Telescope and the Arecibo Observatory. Image credit: B. Saxton (NRAO/AUI/NSF). 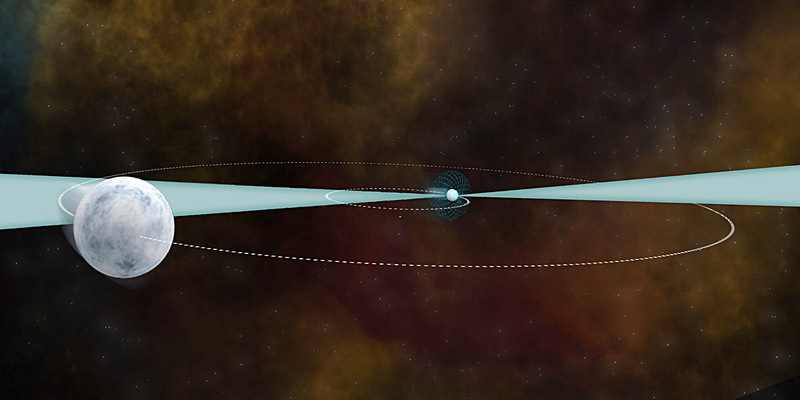 Astronomers using the National Science Foundation’s (NSF) Green Bank Telescope (GBT) in West Virginia and its Arecibo Observatory in Puerto Rico conducted a 21-year study to precisely measure the steady “tick-tick-tick” of a pulsar known as PSR J1713+0747. This painstaking research produced the best constraint ever of the gravitational constant measured outside of our solar system. Pulsars are the rapidly spinning, superdense remains of massive stars that detonated as supernovae. They are detected from Earth by the beams of radio waves that emanate from their magnetic poles and sweep across space as the pulsar rotates. Since they are phenomenally dense and massive, yet comparatively small — a mere 20-25 kilometres (12-16 miles) across — some pulsars are able to maintain their rate of spin with a consistency that rivals the best atomic clocks on Earth. This makes pulsars exceptional cosmic laboratories to study the fundamental nature of space, time, and gravity.